Thanks everyone for their responses, cool collections all. UK magazine amateur photographer regular run articles on iconic film cameras but I have yet to see Minolta feature. 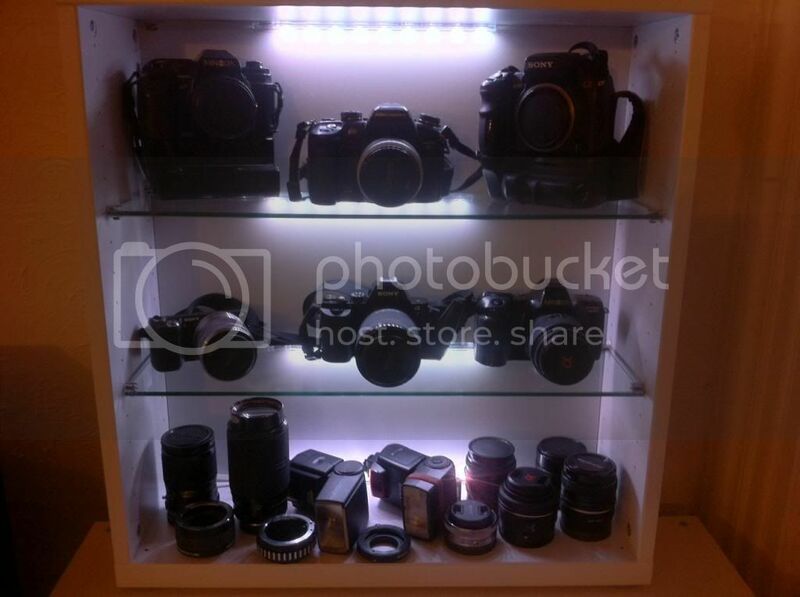 It seems also that there is a [crazy] world of camera collectors out there who have no intention of ever using them, but displaying them in cabinets. Though I had a Minolta X-370 for a couple of months (even less) back in the 80s, I mainly settled on A-mount jumping ship from Nikon film cameras. I came to Minolta film cameras after I got my A100; before that I had all sorts of SLRs, including a string of Olympuses ending in the iS-3000, a nice 35-180 all-in-one zoom body. Remarkably affordable lenses, compared to AF mount equivalents. 9000 -- stolen and replaced, still have replacement. Probably will forever, since it's hardly worth selling any more. 9 (non-SSM) -- still have, not sure why I keep it, except I'm not sure it's really worth selling anymore either. Sony A 700 -- all I really use any more. Vertical grips for the 9, 7D and A 700. Always bought along with the camera, and only ever removed very temporarily for cleaning and such. Various flashes, last used around a decade ago or so (though I still use studio flashes). So, I have all but one fixed focal length lens I ever owned, but half the zooms have disappeared, and the 70-210 is liable to go as soon as I get a 200/2.8. I'm afraid I've done a poor job of supporting Sony's effort to sell lenses -- the whole time I've owned the Sony body, it's never had a Sony lens mounted to it. Worse, there's no end in sight -- my next lens will probably be a 200/2.8. Sony should probably send me a 135/1.8 and a 70-400G for free just to end such a travesty! Some really kewl collections posted here. Here's my list. 2008- Maxxum 7 OH Yeah!!! 2008- Maxxum XTsi- needs repair- AF module or mirror reset. plus assorted flashes and lenses. What do I reach for most often these days? The Maxxum 70/Dynax 60- Yes, I know its crippled with a slow flash sync and a slow top speed, but better AF than the 3-point XTsi in a lightweight body that is not sized for a child. Hello Lightspirit and welcome to the forum. This is my Minolta and Sony collection. Top shelf left to right. My trusty old Minolta 9000, KM 7D and A700. Bottom shelf. Assorted lenses, flashes and adapters. Looking forward to adding a few more old Minolta film cameras in there. I'd like an old 7000 in decent condition as it was my first ever SLR back in the late 80's. Quite like to get an X-700 as some point too. One or two of the later Minolta film cameras would be quite interesting to get hold of as well. I have a few old Minolta cameras and lenses. As long as you're not looking for top-of-the-line lenses, the stuff is pretty cheap. Plus, I got a 7000 w/50/1.7 from a family member. So, it's not too hard to get a collection started, but really, I'm not going to collect 'em all. I like rangefinders, so I finally got a Minolta E offa eBay, but I have a couple of other brands too, when it comes to old rangefinder style cameras. I just have trouble bringing myself to use film; digital is so more convenient.